This page is intended to explain all those mysterious acronyms and phrases which leave the new (and not so new) orienteer baffled. Click the initial letter of the jargon which is troubling you, or just scroll through. If you can't find what you are looking for in here, please tell the compiler, Ian Ditchfield, who will try to write an explanation. Even better, write a new entry yourself and send it in. Likewise any corrections or additions to existing entries. If you are after a general explanation of orienteering, please see the Your First Orienteering Event page of this web site, or on the national governing body's web site. This page is on the Mole Valley web site, so no apologies for the presence of internal Mole Valley information, and more detail on south-east competitions than those for other areas. However, other orienteers are very welcome to browse (and contribute) and I hope you find it useful. At Level A events, juniors usually have a choice of two age class courses, imaginatively called “A” and “B”. “A” is the more prestigious, “B” being both shorter and easier. There may also be an elite course for M20 and W20. A very minor “event” which is not regarded as a competition and for which officially no results should be produced. The advantage of “activities” is that they do not attract BOF Levy. The classification by age and gender used at most serious orienteering events. Also known as BOF Class. A British Orienteering web page has details. Orienteering is not a sport for people who want to conceal their age! A technique for finding a control on a line feature by deliberately missing it! If you aim to hit the line feature at the control and don't get it exactly right, when you reach the feature, you may not know whether to turn right or left. If you ¨aim off¨ to ensure that you hit the feature to the right (say) of the control, then you will know for sure that you have to turn left. Airienteers. A club covering Leeds, Bradford, and the Craven district of Yorkshire. Web site. The place, often a corner of a field, where enquiries, registration, and optional features of an event like toilets, traders, & results display are concentrated. A feature near to your control which is easier to find. You may wish to run fast to your attack point, and then take more care on your approach to the control. Ayrshire Orienteering Club. A Scottish club. Web site. At Level A events, juniors usually have a choice of two age class courses, imaginatively called “A” and “B”. “B” is both shorter and easier than the more prestigious “A”. Name which disappeared two re-organisations ago for an event roughly equivalent to the modern Level B. Badge events used to be important in the British Orienteering incentive scheme which was running at the time. The modern replacement badge scheme only covers Level A events. Basingstoke, Andover, and District Orienteers. A club. Web site. A pre-marked map which is already in a transparent plastic bag (to protect it from the weather) when you pick it up. British Army Orienteering Club. A closed club, but most events are open, including the Military League (South). Web site. BARROw-in-Furness and district orienteering club. A short-lived club, formed in 2005 and disbanded in 2014. Another term for protractor compass. Badenoch & Strathspey Orienteering Club. Web site. Direction determined using a compass. British Elite Orienteering Championship. Because the British Championship rotates around the country, it is not always held in the best possible terrain. This is thought to be good enough for juniors and veterans, but not acceptable for the M/W20 & M/W21 age classes! Therefore in some years, championships for these classes are separated from the main British Championship and given their own event. A control which cannot be reliably found by careful map reading, instead needing an element of luck. Normally caused either by an inaccurate map, or by the control being in thick vegetation a long way from any attack point. Berkshire Orienteers. A club. Web site. Border Liners orienteering club, based in North Cumbria. Web site. A rare colour-coded course, no more difficult than the Brown course, but significantly longer. Staged annually by the Norwegian club Fredrikstad Skiklubb since the early 1970's, Blodslitet is a mass start long distance race using several loops with competitors returning to the finish arena after each lap. The literal translation of ¨Blodslitet¨ is ¨Blood Spiller¨. This gives an idea of the original thinking behind the event, but thankfully it has been toned down a little to accommodate some of us lesser mortals! SROC introduced a British version, also intended to become an annual event, in 2002. It was renamed the Tim Watkins Trophy after the principle organiser died following a car accident in March 2005. The middle distance, technically hard, colour-coded course. The same standard as the shorter Green and the longer Brown. Sometimes there's also a Short Blue course, of the same standard but shorter, while still being longer than Green. British Mountain Bike Orienteering. The governing body for mountain bike orienteering. Web site. British Orienteering. A new name for BOF with a somewhat unfortunate acronym, which we are not supposed to use. British Orienteering Championship. An annual event, held in a different region of the country each year. The most prestigious domestic event to win in the eyes of non-orienteers; but actually only roughly equal in status with the JK. There is a separate prize for each age class, so there are actually 32 British Champions! Usually held on a Saturday, and followed by the British Relay Championship on the Sunday. British Orienteering Federation. The governing body of our sport in the United Kingdom. Makes the rules, co-ordinates the fixtures, organises publicity, and much more. The BOF web site is aptly described as a mine of information: it contains much valuable data, but some of it is hard to dig out. Officially, the term ¨BOF¨ should no longer be used, as it has been realised that it means nothing to the uninitiated, whereas the new name “British Orienteering” is much clearer. However, as evidenced by this web page, old habits die hard! Membership of BOF is mildly confusing. BOF is a Federation of twelve associations, nine of them regional associations such as the SEOA, plus three national associations for Wales, Scotland & Northern Ireland. However, the members with voting rights at the AGM are individual orienteers, not the associations which make up the federation. Every serious orienteer in the UK is a member of BOF, and the vast majority are also members of a club and a regional or national association. There is usually some proposal outstanding to change this system. Another name for age class, more accurate (since gender counts as well as age) but less used. One of the sources of funding for BOF is a levy, or tax, on the income from events organised by orienteering clubs. Unique identifier issued by BOF to member orienteers. Very useful to anyone trying to capture details for a computerised results at an event, as the database will provide competitor name and other details from the number without further typing. A ranking list compiled using a complex formula from the results of almost all events in Britain of Level C or higher. Events where there is no set course (e.g. score events) or people start close together (e.g. relay or chasing start events) are excluded. The BOF Rankings have a web site. Bristol Orienteering Klubb. Web site. The name BOK give to their biggest event each year. The equivalent of a Green colour-coded course at a night event. Long socks with reinforcement over the shins to give some protection from vegetation. Personally, I prefer to wear short socks and gaiters. Remains of branches left on the ground after forestry work. The name for an Emit electronic control card in the original Norwegian. Pronounced “brick”, and occasionally spelled that way in English. The trading name of the British Orienteering Federation. The standard which you need to achieve three times on age class courses at Level A events in order to qualify for a Bronze badge. Details are on a British Orienteering web page. The longest course common colour-coded course, although occasionally a longer Black course is available. Technically difficult, but no harder than the Blue course. The route should be cross-country as much as possible (but not if this means forcing people through unpleasant vegetation), with significant route choice. If possible, finding the controls should require careful map reading (although it must remain possible to reliably find the controls from the map without needing luck; controls should never be hidden). Sometimes there's also a Short Brown course, of the same standard but shorter, while still being longer than Blue. British Schools Orienteering Association. Web site. British Universities & Colleges Sport. Web site. British Universities Sports Association, superseded by BUCS. Annual two-day event organised by a different SWOA club each year. First day is a Level B event. Second day is a chasing start. At events for which start times are allocated in advance, you usually need to get to the start area two, three, or four minutes before your start time, in order to “called up” by the start officials. In Mole Valley, the club captain organises relay teams and tries to persuade people to turn out for other events, such as CompassSport Trophy or South-East League events, in which their run can contribute to a club score. A large feature beyond a control that, when reached, informs competitors that the control has been missed. Normally a line feature, such as a path or a stream. Not to be confused with a collecting feature! An orienteering game for your PC. The free demo version is pretty good, reportedly the full version is even better. Web site. The standard which you need to achieve three times in a single year at Level_A events in order to qualify for a “Championship” badge. Details are on a British Orienteering web page. Sometimes used on the final day of a multi-day event, with the intention of providing a race in which the first person to cross the finish line is the winner. The total time taken by each competitor during the previous day(s) is added to an arbitrary base time to give the start time for the competitor. Thus if a chasing start with a base time 8am is used on the third day of a 3-day event, and Joe has taken 60:00 and 75:00 on the previous two days, he will start at 10:15:00. If Fred has taken 65:00 and 70:01, his aggregate time over the first two days is 1 second longer, so he will start one second later at 10:15:01. At a SportIdent electronic punching event, you check your dibber is working by punching at a “check station” after you have cleared and before you start. Chigwell & Epping Forest orienteering club, based in the north-east London. Web site. The name TVOC give to their biggest event each year. The equivalent of a Brown colour-coded course at a night event. The map symbol for a control site is a circle, normally 7mm across. You are “in the circle” when you get within 35m of the control on a 1:10,000 scale map. A club named after the old wapentake (Viking district) covering Harrogate, Ripon, and Nidderdale. Web site. Term usually only used in international competitions, to distinguish a traditional “long” course distance event from a short distance event, probably held on a different day at the same meeting. At a SportIdent electronic punching event, you must empty your dibber of previous records by punching at a “clear station” (which looks exactly like a control apart from not having a kite and being easy to find) before you start your course. The worst mistake you can make is to punch the clear unit again after finishing your course but before downloading. Cleveland Orienteering Klubb. Web site. A club which not anybody can join, usually because membership is restricted to current or former members of some institution. Examples are university clubs and the Army club. An event which only certain people are allowed to enter. Examples are events for which you have to qualify by getting good results in other events, such as the British Elite Championships; events for which you have to be selected, such as international matches; or at the other end of the scale, small events that clubs put on for their own members only. At events which can be entered in advance, the closing date is a deadline for advance entries. Event details should make it clear whether entries after the closing date will be rejected, or will simply cost more money. A place where you can leave coats or other clothing while you run. Likely to be provided at winter events with a significant walk from the car park to the Start. Your clothing may remain where you leave it, or there may be a clothing transfer. A facility sometimes provided whereby the organisers will move garments left at a clothing dump either to somewhere near the Finish or the Assembly Area. A Sport England scheme for assuring that sports clubs meet defined standards of bureaucracy. Web site. Clydeside orienteers. A Glasgow club. Web site. City of Birmingham Orienteering Club. Web site. A large feature before a control that, when reached, informs competitors how far they have progressed towards the control. Normally a line feature, such as a path or a stream. Not to be confused with a catching feature! A course named after a colour, for example Yellow or Brown, open to anyone irrespective of age class. In theory a course of any given colour should be of about the same difficulty and require about the same amount of physical effort at any event anywhere in the country. Unfortunately, many South-East areas are not technically difficult enough for the harder courses, nevertheless we in the South-East normally claim to put on a full range of courses. This means that the theory breaks down, and courses of the same colour tend to be more technical in the better orienteering areas. A British Orienteering web page has further details. Defunct term for an event offering colour-coded courses, the nearest modern equivalent would be a Regional event, although colour-coded courses are often found at other events too. A device for orientating yourself, very useful in orienteering! The red needle on a compass always points in the direction of the magnetic north pole, i.e. up the map. 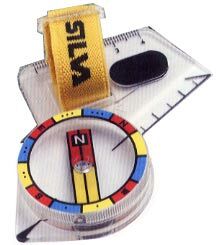 There are three sorts: the protractor compass (illustrated) which is held in the hand; the thumb compass which is strapped on to a thumb; and the clip compass which is attached to the edge of the map. Vendor of orienteering equipment. The second most likely, after Ultrasport, to be found at events. Web site. Britain's only national orienteering magazine. Web site. This annual event is the most important inter-club competition. Traditionally, it was a knock-out competition with pairs of clubs competing against each other in a series of rounds, along the lines of football's FA Cup. The current format has only two rounds, the first being regional heats at which around six clubs compete for a single place in the final. The competition was invented by CompassSport magazine but is run by BOF. A CompassSport Cup event requires eight different courses, with people from different age classes running different courses. Each competing club can provide as many runners as it likes on each course. There is no advance team selection and the “best” 25 performances from each club count, subject to some constraints to ensure that successful clubs field people in a wide variety of age classes. Competition web site. Equivalent of the CompassSport Cup for smaller clubs. The rules are the same as for the Cup except that only 13 scorers are required. A change to the threshold splitting big and small clubs meant that Mole Valley competed in the Trophy for the first time in 2008. Competition web site. The name BKO give to their biggest event each year. Computer program used by many clubs for planning courses, producing control descriptions and files for printing courses. Web site. The brown lines on a map linking points of equal height. I find it more helpful to think of them as separating higher ground from lower ground. Unfortunately they are not marked on the ground! The vertical height difference that you should have to climb, or descend, to move across the map from one contour line to the next. The contour interval should be printed in the “white space” around the edge of the map, probably next to the scale. Choosing a route which keeps to the same height, thus following a contour line on the map. A point on your course which you have to visit, marked on your map with a circle. At each control, you should see a marker or kite, a code, and a punch. Each orienteer carries a control card around the course. At each control, the card is marked to identify the control visited. Traditionally, control cards were made of card or stiff paper, and marked with a needle punch which made a pattern of holes in the card. Most events now use electronic control cards, the two competing systems being Emit and SportIdent. A code, normally two letters or three numbers, displayed at each control site. If you are at the correct control, the code will also be found in your control descriptions. A list of the controls you have to find, including for each control the code and a description of the geographical feature you are looking for. At minor events, and for young junior courses everywhere, the descriptions will be written in English (in this country anyway)! At major events, pictorial control descriptions will ensure that foreigners are not disadvantaged. What you are looking for when you go around an orienteering course! Each control site is at the centre of a circle marked on your map and at a feature described in your control descriptions. You know you have reached it because you see a brightly-coloured kite and you know it is the right one because a control code is displayed which agrees with the one in your control descriptions. Electronic equipment found at each control site at an electronic punching event. One of the three main officials at an orienteering event, the others being the organiser and planner. The controller should oversee the event, and is responsible for ensuring that the courses are fair, and that the whole competition is organised in accordance with the rules of the sport. The controller is usually the most experienced official, and usually comes from a club other than the organising club. Course with a modified map occasionally found at a training event or activity. Instead of the whole map being printed, only a thin strip linking the controls will be shown. This should allow you to practise “going straight” rather than diverting along paths. When you take part in an orienteering event, you usually do one course. A course comprises a start, several controls, and a finish. You have to visit them all in the right order (except on a score course). Croydon Orienteering Club, once Mole Valley's neighbours to the north-east. Disbanded autumn 2007, with most members transferring to DFOK. Welsh multi-day event, held in August every Leap Year. Usually six Level B events in a week. Web site. The normal form of orienteering event, in which competitors visit controls in a prescribed sequence, and the fastest wins. A specific location marked on the map at which a line feature, typically a wall or fence, may be traversed. Crossing points may be voluntary, in which case crossing at the marked point will normally be easier than elsewhere. Often, crossing points are “compulsory”, in which case a competitor crossing elsewhere risks disqualification. Usually, a compulsory crossing point results from the requirements of the landowner, and even a single person crossing elsewhere can lead to the loss of the area to orienteering. Cambridge University Orienteering Club. (I can't be bothered to list all university orienteering clubs, which can usually be identified by the “UOC” suffix; this one is included because it occasionally organises public events which Moles may attend.) Web site. A point at which you can no longer continue in the same direction, for example being required to turn right at a path junction. A decision point on a leg does not imply a route choice. There may be only one obvious route between controls, but this could require the ability to change direction at a number of decision points. Deeside orienteering club, based in Cheshire. Web site. A hole in the ground. The difference between a depression and a re-entrant is that a depression will turn into a pond if it rains enough, whereas water will flow downhill out of a re-entrant. The mental state brought on by wandering around the forest unsuccessfully looking for a small hole in the ground. Devon orienteering club. Web site. Dartford Orienteering Klubb, based in the Kent/London borders. The initials result from the original club name of Darwin Forest. Web site. Slang term for a SportIdent electronic control card. Defence Infrastructure Organisation. Government agency responsible for obstructing army and civilian access to military training areas. Web site. Defunct term roughly replaced by Level C event, which became Regional event. Did Not Finish. Normally appears by your name in the results list if you give up, or lose your electionic control card. Please do always report to the download whether you finish your course or not, otherwise it will be assumed that you have met with an accident and people will be sent out to search for you. Orienteering shoes with metal-tipped studs. Ideal for getting a grip on brashings or wet rock, but they do tend to transmit shock waves up the legs when running on hard surfaces. The name WSX give to their biggest event each year. Annual pair (Saturday & Sunday) of Level B events organised by NOR. At an electronic punching event, the action of transferring information from your electronic control card to the organisers' computer. The most important rule in electronic orienteering is that if you have registered you must go the download station and ensure that you are recorded there as well. Failure to comply with this will mean that the organisers will think you are still out in the forest, and may organise a search. Please be particularly careful to ensure that you are recorded if you have lost your electronic control card (since you won't be able to download electronically in the normal way). Derwent Valley Orienteers. A Derbyshire club. Web site. East Anglian Orienteering Association. The regional association for East Anglia. Web site. A club named for the old name of York, covering North Yorkshire south of the North Yorkshire Moors watershed and east of the A1. Web site. Electronic control card, such as a SI dibber or an Emit brikke. Loch Eck Orienteers. A club from Dunoon, Argyll, Scotland. Web site. East of England Orienteering League. A series of midweek events, an equivalent of the Military League (South), covering Eastern England from north London to Yorkshire. Fixtures on the RAFO web site. Using an hi-tech device, such as a SportIdent dibber or an Emit brikke, instead of the traditional paper control card. A path that appears during a competition due to many orienteers trampling the vegetation along the same route. At events of National Event and higher standard, extra long courses are provided for the best competitors at M/W20 and M/W21 age classes. Entry is usually restricted by selection. East Lothian Orienteers. A Scottish club. Web site. East Midlands Orienteering Association. The regional association for the East Midlands. Web site. One of two competing forms of electronic punching equipment, replacing the traditional paper control card and needle punch. With EMIT, you carry a brikke in your hand, which you fit into a socket at the control site. The rival SportIdent system is more popular in Britain, although Army and SCOA events use Emit. Web site. English Orienteering Council. The national association for England, unlike its other British equivalents, not part of the BOF federation. Web site. Entry On the Day. Meaning that you can just turn up on the day of the event, find registration, and buy your run. East Pennine Orienteering Club, based in Yorkshire. Web site. The club for North Wales. Web site. Edinburgh Southern Orienteering Club. Web site. An orienteering competition, at which there will be a number of courses. The term “event” emphasises that the fact that you can enjoy participating in orienteering without actually competing. Most popular of several companies which event organisers may use to collect advance entries over the internet. Web site. Anything marked on the map which might help you navigate or be used as a control site. Slang term for thick or unpleasant vegetation represented by the darkest of the green colours on the map. The end of your course, where your final time is recorded. Marked on your map by a pair of concentric circles. At events with traditional paper control cards, your card will be collected at the finish. The most important rule in orienteering is that if you are recorded as being in the forest, you must ensure that you are recorded as having left it. At an event with traditional control cards, this meant that you must visit the finish if you went through the start, even if you did not complete the course. At electronic punching events, the start and finish are no longer so important, and the rule is that if you registered than you must visit the download before departing the event, even if you never actually start your course. Another term for a control kite. To run out of energy half-way around a course! Foot & Mouth Disease. Infectious disease of cloven hoofed animals which causes panic amongst humans. Web site. A technical term in orienteering, meaning the competition area. Usually accurate in layman's terms too, but occasionally an orienteering forest may have no trees at all! An extra contour on the map, with a dashed brown line instead of the normal solid one. Like a normal contour line, a form line links points of equal height. Unlike a normal contour line, it does not indicate a vertical separation of one contour interval from the adjacent contour lines. Form lines are used by the mapper to convey the shape of particularly small or detailed landforms to the orienteer. An annual series of races, over a mix of distances for the older juniors, in classes M18, M20, W18, and W20. Points are gained based on finishing position in each race. Something like eleven races, with the best six results for each competitor counting. . The highest scorers then compete in a “final”. Future Champions results have a big influence on the selectors for summer tours and the national squad. Web site. Replaced by the UK Orienteering League from 2013. Forth Valley Orienteers. A Scottish club. Web site. At a relay event, people in different teams run more or less the same course at the same time. So that everyone has to navigate, rather than just follow the person in front, the courses are normally ¨gaffled¨ so that there are two or three controls close to each other, with each person visiting only one of them. In order that fairness is preserved, each team must collectively run the same legs by the end of the event, but in a three-person relay, any given leg may be on the first lap for some teams, the second lap for others, and the third lap for the remainder. Norwegian word meaning ¨the gallop¨, popularly mistranslated by the British as ¨ranking list¨. Some series of events are called galoppens, the best known locally being the South-East Galoppen. A trophy presented annually to the Mole Valley member aged 40 or over who scores most points for the club in the South-East League. Presented in memory of a Mole Valley member who died around 1988. Greater London Orienteering Summer Series. An annual series of (usually) four events on consecutive weekends in July, held on areas within or very close to the M25. The areas need to have an extensive path network or a large amount of mown grass, since running cross-country in the South-East in high summer is rarely pleasant. Every competitor runs the same course of Light Green standard. The Frolics are of particular interest to new orienteers as there is a handicap system which adjusts not just for age class as usual, but also for performance record. Thus being an experienced orienteer is a substantial disadvantage. Originally there was a strong bias to the social side with events in London Parks and pre-entered teams of 8 from different clubs locked in friendly rivalry before recourse to the pub. Nowadays the events have become more normal: entry on the day, and no limit on team size, although only six can score from each club, but it is hoped the basic sociability coming from everyone running the same course carries on. More information on the LOK web site. Guildford Orienteers. A club, Mole Valley's neighbours to the west. Web site. The standard which you need to achieve three times at Level A events in order to qualify for a Gold badge. Details are on a British Orienteering web page. Grampian Orienteers. A Scottish club. Web site. Slang term for any of the less runnable forest indicated by various shades of green colouration on the map. A technically hard but not too strenuous colour-coded course. Longer and harder than Light Green, shorter but no easier than Blue. The route should be cross-country as much as possible (but not if this means forcing people through unpleasant vegetation), with significant route choice. If possible, finding the controls should require careful map reading (although it must remain possible to reliably find the controls from the map without needing luck; controls should never be hidden). Sometimes there's also a Short Green course, of the same standard but shorter. Occasionally there's even a Very Short Green. This last would probably be aimed at the oldest and most frail competitors, so the planner should attempt the difficult feat of producing a course which is technically hard but physically easy. A means of identifying any point in Great Britain with a brief code. The usual ¨six figure¨ grid reference identifies a box 100m square using only two letters and six numbers. An explanation can be found on any Ordnance Survey map or at this web site. Humberside And Lincolnshire Orienteers. Web site. A handicap competition is usually one in which the results are adjusted in a predetermined way in order to allow people from different age classes to compete on level terms. For an individual competition, this would normally be done by multiplying time taken or points scored by a different factor for each class. For a relay, each class would be allocated a number of handicap points and each team would have to be picked to get below a handicap limit; the race would then be won by the first across the finish line as usual. Another term for line feature. The name BADO give to their biggest event each year. A team event which requires planning and coordination under time pressure, originating in Germany and introduced to the UK in the late 1980's by the then chairman of army orienteering, Lt. Col. Steve Harris. Despite the relay in the name, all team members receive identical maps and run simultaneously. It is a Spanish Score event, with two sets of controls. ¨Spine¨ controls must be visited by each and every team member. The remaining controls need be visited by only one team member. The team's time is that of the last member to reach the finish. Failure to collectively punch each control or individually punch each spine control will be penalised, by a hefty time penalty or possibly outright disqualification. It is vital for the team to plan and agree who is going to which controls before leaving the start! Annual relay, held in a different region of the county each year, usually in summer. Possibly the most eccentric event in the calendar. The main event is a seven person relay, with the start timed so that the first three or four laps are run in the dark, with the remainder after dawn. Usually, this means a start soon after the pubs close for the night! There is also a five-person relay with shorter laps. The main prizes are on the seven-person course, an open class in which any combination can run, and a handicap class. Mole Valley won the Handicap class in 1999. Competition rules in a British Orienteering document. Called the ¨Harvester¨ for the obvious reason that it was invented and first organised by the now defunct Combined Harvesters orienteering club. Now, can anyone explain that name? Havering and South Essex Orienteering Club. Web site. Collective noun for a group of orienteers 30 seconds after the beginning of a mass start score event. Happy Herts orienteering club, based in Hertfordshire. Web site. Harlequins Orienteering Club. A club based in the West Midlands conurbation. Web site. Annual contests between selected teams representing England, Wales, Scotland, & Northern Ireland. Interlopers. An Edinburgh club. Web site. Inverness Orienteering club. Britain's most northerly club. Web site. International Orienteering Federation. The world governing body of our sport. Web site. Another name for pictorial control descriptions. Scottish equivalent of the Yvette Baker Trophy. Named after Scotland's 2003 World Sprint Champion. Junior Inter-Regional Championships. Not strictly the correct title, as it's open to all of BOF's constituent associations, National as well as Regional. For association teams of M/W14s, 16s and 18s. A 2-day competition with individual on first day and relays on the second, both races contributing points to overall title. Held at the end of June. Jan Kjellström festival of orienteering. The annual Easter event, equal in prestige with the British Championship, and held in a different region of the country each year. The individual competitions, for each age class, comprise separate races on Saturday and Sunday, with the aggregate time determining the result. There is then a relay competition Easter Monday. Web page. The event is named for a Swede who was instrumental in introducing orienteering to this country, and died in a road accident in 1967. It is always referred to as the ¨the J K¨, possibly because no English person can pronounce Kjellström. Formerly boys classes at age class events, which have now been abolished. Jesus Orienteering Klubb. Closed club for alumni of Oxford University. Noted for their flying pig logo. Read the club history on their web site for an explanation of the name. Someone who has yet to reach the year of his or her 21st birthday, i.e. age class M20, W20, or younger. Junior World Orienteering Championships. Held in late July, for teams of up to 6 men and 6 women under 21. An IOF web site has details. Formerly girls classes at age class events, which have now been abolished. Not an orienteering term, but the name given by the LDWA to an event requiring navigation between checkpoints identified by grid references. Bring your own map! The orienteering club for Cornwall. Web site. Kingdom of Fife Orienteers. The club formerly known as West Fife Orienteers (WFO). Web site. Karrimor International Mountain Marathon. The first mountain marathon, no longer sponsored by Karrimor and now known as the OMM. The red and white marker hanging at every control site (and at the centre of the Start triangle). The word for club in both Norwegian and Swedish. Some British orienteering clubs like to emphasise the sports Scandinavian origins by calling themselves klubbs. Kent Night Cup. A winter series of Thursday evening night events organised mainly by SAX and DFOK. English multi-day event, held in August every fourth year, avoiding the years with a Scottish or Welsh equivalent. Five Level B events on consecutive days in the Lake District. Web site. Long Distance Walkers Association. Not an orienteering organisation, but they do arrange events requiring navigation through the countryside, albeit non-competitive and along public rights of way. You have to provide your own Ordnance Survey map. Web site. The section of an orienteering course between two adjacent controls (or between the start and the first control). One person's course at a relay event. In which case, such a leg would be made up of many legs. To avoid this confusion, it has been suggested that a single course at a relay event should be called a lap, and this is the nomenclature used in this Jargon Buster. Unfortunately ¨leg¨ is still the term most people use for a lap. Leicestershire orienteering club. Web site. the most important events, such as the major championships. Often organised by Regional Associations rather than individual clubs. As of May 2017, renamed Major. high quality events aimed at people who are prepared to travel a fair distance, as well as those living locally. Normally organised by individual clubs, but fixtures co-ordinated nationally to avoid clashes. Broadly equivalent to Regional Events two re-organisations ago, and more important than Regional events now. As of May 2017, renamed National. run of the mill National Ranking events. Fixtures co-ordinated at regional level. Broadly equivalent to District Events before the most recent re-organisation. As of May 2017, renamed Regional. minor events put on by clubs primarily for their own members (and newcomers) with little or no co-ordination with other clubs. Broadly equivalent to Local events before the most recent re-organisation, and as of May 2017 renamed back to Local. And for completeness, there are also Activities, which, unlike events, are not competitions and not supposed to produce formal results. A moderately technical colour-coded course. Longer and harder than Orange, shorter and easier than Green. The route should not be (entirely) along line features, but must require cross-country navigation. However, areas of complex contours should be avoided, and controls should have a collecting feature behind them. A smaller range colour-coded courses than would be expected at a normal event. The area may be too small for long courses or too simple for technical courses, or the number of people running colour-coded courses may be too small to justify the effort of planning the full range. Most events offering limited colour-coded courses are Level D events, but Level A or B events which are primarily orgainsed around age-class courses may offer them for beginners. Anything on the map which can be followed, such as a path, stream, or wall. Lakeland Orienteering Club. Web site. One of the functions of BOF is to periodically change the names which indicate the relative status of orienteering events. From May 2017, the lowest level of formal orienteering event has been renamed from Level D to "Local"; a reversion to the name as it had two reorganisations ago. The next level up is now "Regional" event. Local events are minor events put on by clubs primarily for their own members (and newcomers) with little or no co-ordination with other clubs. They have some advantages: they tend to be cheap to enter, easy to put on, and not too crowded. Many orienteers go to more local events than any other sort. A person who is a member of an orienteering club, but is not a member of BOF through that club. This may be because the person is not a member of BOF at all, or it may be because the person's prime loyalty is to a different orienteering club. Lincoln Orienteering Group. A club. Web site. London Orienteering Klubb, based in London north of the Thames. Web site. A loop race is a mass start event, producing head-to-head racing with the winner being the first to cross the finish line. Some requirement to navigate is preserved by the courses being gaffled, which means that, while each person eventually runs the same legs as every other, the sequence may be different. There are two different ways to achieve this. One is to have effectively a one-person relay, with the competitors running two, three, or even more (depending on the competition rules) laps consecutively, using a map which shows only one lap. Each lap would share the same start and finish, which would be adjacent, and there would be a map exchange between laps. The alternative is for the entire course to be printed on just one map. It is still necessary for the competitors to keep revisiting a single point at which the different loops start and finish, but this need no longer be the start and finish points for the entire race. A feature of this method is that the map gets a lot of overprint around the common control. If there are three loops, then the common control will be visited no less than four times, meaning that eight purple lines and four numbers have to be fitted around it. The competitor must take great care to leave the common control in the right direction each time; running a loop in the wrong sequence or in the wrong direction will result in disqualification. Body-hugging tights worn by many orienteers. The name comes from the material of which they are made. One of the functions of BOF is to periodically change the names which indicate the relative status of orienteering events. From May 2017, the most important events, the main championships, have been renamed from Level A to "Major". The next rung down are now "National" events, which is especially confusing since before two renamings ago, "National" was the top level. Some farmers have discovered that the public is willing to pay admission to wander around a maze constructed of paths mown through a maize (Indian corn) crop. Not just do they get more money than they would from selling the crop, they can still harvest most of the crop at the end of the season. Some orienteers have discovered that maze maizes make for a great orienteering challenge. Definitely worth trying at least once! The orienteer's most important tool, we'd be lost without it (literally). Orienteering maps are larger scale and much more detailed and accurate than Ordance Survey maps. A detailed introduction is beyond the scope of this Jargon Buster, but the thing that most confuses beginners is the colours. For a forest map, white means runnable forest, progressively darker shades of green indicate progressively thicker trees and/or undergrowth, while yellow/orange colours are used for open areas. A tough transparent plastic bag that you can put your orienteering map in to protect it from weather, forest, and sweat. Rarely seen now that most maps are printed on waterproof paper. Alterations required to an out of date map. Often, at an event using master maps, there will be some map corrections for you to copy down near Registration. The process of swapping one map for another in competition time. The competitor would drop the map used to find the location and pick up a new one. Sometimes used when a long course on a small area would produce too many crossing lines if printed on one copy of the map. A course which you have to complete without taking a map with you. Instead, each control has a little section of map showing the leg to the next. You have to study this and leave it in place when you set out for the next control. Good training, since it forces you to decide on your route and identify the key features rather than just rush off. Mar Orienteering Club. A Scottish club. Web site. The equivalent of a Red colour-coded course at a night event. All competitors, or one competitor from each team, start simultaneously. Always used for relays, sometimes used for score events. Except in score events, one consequence of a mass start is that the first to cross the finish line is the winner (unless disqualified). One of a small number of maps with courses drawn onto it by the planner. At an event with master maps, you get given a map with no course on it at Registration. Usually, the master maps will be located just after theStart, and your first task after your time starts is to copy down your course from the master map. Sometimes (normally for beginners courses), the master map will be before the Start, so you can copy the map at your leisure. Rarely seen these days, it is now usual for the course to be printed on your map before you get it. A complex network of uncrossable barriers providing an intricate navigation problem. Sometimes manufactured for the event out of crowd-control barriers, sometimes created by selectively mowing a maize crop. Good fun, and surprisingly difficult at speed! Manchester and District Orienteering Club. Web site. Formerly Merseyside Orienteering Club, now defunct. The name CHIG give to their biggest event each year. A variation of orienteering which requires very precise navigation to select the correct control kite from a cluster. On a conventional course, there should be no other control kites within 30m of the one you are looking for. In micro-O, there will be. Furthermore, there will be no control codes for you to check. You must therefore use your skill with the map to ensure that you punch the correct control, which will be exactly in the centre of the circle on your map and fit with the feature described in your control descriptions. If you punch the wrong control in a cluster at micro-O, you don't get disqualified. Instead you get some other sort of penalty, probably added time, but remain competitive. Further information may be found at this web page relating to what I believe was the first serious UK event to use micro-O (as part only of some courses only). An event in conventional orienteering terrain with fairly frequent controls, so that the competitor has to do a lot of fine navigation into controls. As the name implies, the course will be of shorter than usual length, but not as short as a short or sprint distance. A series of midweek events, mostly organised by BAOC, popular with civilians who do not have to work all day every Wednesday. Details on the BAOC web site. Events are always open to everyone, although occasionally advance notice of attendance and proof of identity may be required for security reasons. They can be anywhere in southern Britain, but tend to concentrate near the army bases near Aldershot and Salisbury Plain. Relays always have a mass start for the first lap, with competitors running second or subsequent laps usually starting when the previous runner in their team finishes. Mini mass starts are a device for reducing the elapsed time taken by the slowest teams. Some time after all the runners for the teams in contention have started, the remaining runners on the same lap may be started together in a mini mass start, without waiting for their previous lap runners to finish. A competitor whose visit to a particular control is not recorded on the control card (whether paper or electronic) is said to have ¨mispunched¨. This will normally be because the competitor has accidentally missed out the control or visited the wrong control without realising. More rarely, competitor may have failed to operate the punch correctly. The trophy presented to the fastest lady at the Mole Valley club championship, contested annually at a colour-coded event. Traditionally run over Blue course, but in recent years a Green course has been chosen to allow the more elderly or less fit to join in. Also a frequently used name for a female Mole Valley relay team. Marlborough Orienteering Klubb, defunct, having merged with SLOG in 2005 to form NWO. An evening event primarily for Mole Valley members (and prospective new members) with an emphasis on socialising rather than competition. Normally some sort of orienteering-related activity followed by food and drink. Mole Nights were first introduced in 2011, and are currently twice a month on Thursdays during the lighter half of the year. A common name for a Mole relay team, resulting from the scientific definition of momentum as mass x velocity, or MV. A regular series of local orienteering-related activities intended for people who are not (yet) regular orienteers, or do not wish to travel far. Now defunct? Momentum met once a week at the Leatherhead Leisure Centre. Moravian Orienteers. A Scottish club. Web site. Long distance orienteering event in hills or mountains, usually two events in consecutive days with aggregate time counting. Frequently, competitors have to carry food and shelter for the overnight stop. Events are listed on this adventure racing web site, amidst other non-orienteering events. Mountain Bike Orienteering. Orienteering on two wheels. An IOF web page has information, or see the BMBO web site. A series of separate orienteering events over a restricted time period, usually with some sort of combined scoring system to produce overall winners for each class. Possibly three events on consecutive days of a Bank Holiday, such as Springtime in Shropshire, or six events in seven days during a summer week, such as the Scottish 6-Days. Mole Valley. That's us! The standard abbreviation for Mole Valley Orienteering Club. Mole Valley Map & Compass Foot Racing Society. The formal name of Mole Valley Orienteering Club. The official explanation for this name is that when Mole Valley was formed, the term ¨orienteering¨ was not widely understood by the general public (so no change there then! ), and a name was chosen to better describe the sport. The unofficial explanation is that our founder, Toby Norris, being a scientist, was keen to have the letters FRS (Fellow of the Royal Society) after his name. Miami Valley Orienteering Club. Nothing to do with Mole Valley, or even Miami in Florida, this club is based in Ohio, USA. Web site. Mid Wales Orienteers, a club. Website. Three of twelve groups which make up BOF are the National Associations for Wales, Scotland & Northern Ireland. Constitutionally, they have similar status to the English Regional Associations, although the Scottish Association is more independent and powerful than the others. Additionally, they are responsible for teams for the Home Internationals. Just to make matters really confusing, there is also an English national association which is not a member of BOF, and seems to have little function beyond selecting home international teams! One of the functions of BOF is to periodically change the names which indicate the relative status of orienteering events. From May 2017, high quality events which are not major championships, but still aimed at people prepared to travel a fair distance (as well as those living locally) have been renamed from Level B to "National". This is especially confusing as up to two reorganisations ago, "National" events were the top level. Broadly equivalent to Regional Events two re-organisations ago, and more important than Regional events now. The appropriateness of this grade name inflation can be judged from the fact that there are often simultaneous "National" events taking place in different parts of the nation. The higher level is now "Major" event, and the next level down is now "Regional" event. Newcastle & Tyneside Orienteers. A club. Web site. The equivalent of a Blue colour-coded course at a night event. North-East Orienteering Association. The regional association for North-East England. Web site. North Gloucestershire Orienteering Club. Web site. Yes, this does mean what you think it does! Orienteering after dark with a torch. The best night orienteers are nearly as quick at night as during the day. It's good fun. I recommend trying it, but not until you are reasonably confident in daylight. “Night” is perhaps a misnomer, it means “after dark”, but most events are on winter evenings, and finished by 9pm. There used to be a popular league of night events in the south-east which rejoiced in the acronym SENILE! This disappeared around 2007, but there is now a Kent Night Cup series instead. Northern Ireland Orienteering Association. The national association for those parts of Ireland which are officially British. Web site. Northern Navigators. A club based around Durham and Wearside. Web site. Nottinghamshire Orienteering Club. Web site. A person who runs a course, but whose result is ignored for the purpose of calculating placings, points, or scores. Normally someone who is deemed to have an unfair advantage, perhaps through familiarity with the competition area. Orienteering web site with a useful discussion forum for debating ideas with other orienteers. Annual national league of urban events, mostly full-length rather than sprint, founded and co-ordinated by Nopesport. Became the UK Urban League when Nopesport ceased to be active. (Out of date) web site. Norfolk Orienteering club. Web site. Another term for a map memory event. SOC's annual Level B event in the New Forest on the first Sunday in November. Website. National Outdoor Week or National Outdoor Welcome. An annual campaign to get people into the open air. Defunct? North Wilts Orienteers. Club formed in 2005 by merging MOK (Marlborough Orienteering Klubb) and SLOG (Swindon Locality Orienteering Group) Web site. North-West Orienteering Association. The regional association for North-West England. Web site. Computer program used by many clubs, including Mole Valley, for drawing maps. Can also be used for planning courses, but suffers from expensive and inflexible license conditions, so many prefer to use Condes or Purple Pen instead. Web site. The equivalent of a Yellow colour-coded course at a night event. Annual pair (Saturday & Sunday) of Level B events, organised by a different NEOA club each year. Occasionally one day may be a Level A event. Octavian Droobers orienteering club. Based in Warwickshire. And you thought Map & Compass Foot Racing Society a weird name for an orienteering club? You'll have to read the history on their web site for an explanation of this one. Offa's Dyke Raiders orienteering club, defunct, having merged with ERYRI. One of the first English orienteering clubs, founded by Olympic athlete Gordon Pirie when living at Nutfield in what is now Mole Valley territory. The club became part of SLOW, who now run an annual “OK Nuts Trophy” in memory of the club and in particular their leading member, Mike Wells-Cole, who died in 1976 after training with flu. The equivalent of a Light Green colour-coded course at a night event. Original Mountain Marathon. The first mountain marathon, originally sponsored by Karrimor. Web site. The name GO give to their biggest event each year, named for Occasional Orienteers, a defunct club that became part of GO. A club which anybody can join, i.e. not a closed club. A moderately short and not too difficult colour-coded course. Longer and harder than Yellow, shorter and easier than Light Green, much shorter but no easier than Red. The hardest course which a novice should contemplate at the first event, and then only if an experienced map reader. The route should be along line features such as paths, fences, or streams, but there may be a route choice. Controls may be on point features near to the line feature being followed, but there must a collecting feature behind them. One of the three main officials at an orienteering event, the others being the planner and controller. The organiser is in overall charge of everything that happens “outside the forest”, i.e. is responsible for everything except the planners tasks. A wise organiser will delegate all the tasks and perform a coordinating role. Annual Swedish 5-Days event, on a different area each day. The biggest event in the world. Web site. The name is sometimes applied to British events which involve multiple runs on different areas. Oxford University Orienteering Club. (I can't be bothered to list all university orienteering clubs, which can usually be identified by the “UOC” suffix; this one is included because it occasionally organises public events which Moles may attend.) Web site. Somewhere you are not allowed to go! Usually a part of the mapped area for which permission for orienteering has not been obtained. The usual term for the process of creating pre-marked maps. This traditionally involves a second printing process, adding the course to a map on which the terrain details have already been printed. A technique for estimating distance travelled by counting strides taken. Short course orienteering in a venue that could be described as a park, normally an area of mown grass and flower beds in a town. A course in a public place with control markers permanently in place. The markers will probably be wooden posts rather than kites, and there will be no punches. Permanent courses can be used at any time; you don't need to wait for an event. A British Orienteering web page has further details. A trophy presented annually to the most improved orienteer in the South-East League, in memory of Mole Valley member Peter Burt, who died in May 1999 after a long battle with cancer. It rewards personal achievement on the basis of a fiendishly complicated scoring system in the tradition of Peter's long stewardship of the League. A junior version of the Harvester, open to over-10s and under-19s (i.e. M/W12's to M/W18's inclusive), and named for the “father of British orienteering” who died in 2003. The main race is an 8-person relay starting before dawn, with the first 3-4 legs in the dark. Laps are of varying distances and standards ranging from Yellow to Blue, with at least 2 boys and 2 girls in each team required. A handicap trophy is also available, and there is a 5-person race open to small clubs. The event is normally staged in September in the Midlands. Competition rules in a British Orienteering document. Pendle Forest Orienteering club, based in central Lancashire. Web site. Symbolic control descriptions, defined by the IOF, which have the advantage that they are the same everywhere. You will be grateful if you ever orienteer in a foreign country! Normally used for most courses at major events in this country, so you will still need to learn them eventually even if you have no plans to venture overseas. The official definitions can be downloaded. When you think you known them, have fun testing yourself with this game. One of the three main officials at an orienteering event, the others being the organiser and controller. The planner is responsible for setting the courses, providing the overprinted maps or master maps and the control descriptions, and for getting the controls into the forest and in the right places. A small level patch of ground, typically circular and about 3m in diameter. Often caused by charcoal burning. Anything on the map which is not a line feature, such as a knoll, depression, or boulder. Potteries Orienteering Club. Based in North Staffordshire. Web site. Powys and North Ceredigion Orienteering Club, who changed their name to Mid Wales Orienteers sometime around 2011. At an event with pre-marked maps, you do not get a map at registration. Instead, you pick up a map complete with your course just after the Start. This means that the organisers have to provide a map with a course on for each competitor, which is more trouble and expense than just providing a few Master maps. Pre-marked maps are the norm nowadays at event the smallest event. The traditional form of Trail Orienteering. Well explained on this British Orienteering web page. The traditional form of compass. Term sometimes applied to a short first event in a series of two of more. Possibly the first of the two races in a chasing sprint. A device for marking your control card when you reach a control site. At events using traditional paper control cards, a needle punch (illustrated) will make a distinctive pattern of holes in the card. With electronic equipment such as Emit or SportIdent, the term “punching” is still used to describe the action required to record your visit to the control. At an event with electronic punching, the actual time you start your course may be recorded by ¨punching¨ at the start. This is easier and less stressful than the traditional timed start for both competitor and organisers, as it is not essential to start at a particular second. Free computer program for planning courses, producing control descriptions and files for printing courses. Web site. Quantock Orienteers. A Somerset club. Web site. Royal Air Force Orienteers. Web site. A table which attempts to sequence orienteers in order of merit by awarding points for performances over a number of events. The best known is the BOF Rankings. Scores for the Ranking List, see previous entry. A course of the same standard as Orange, but much longer. Aimed at near beginners who want a longer course. Particularly popular during the London Marathon training season. A re-entrant is a contour feature. It is an indentation into the hillside or a valley, frequently sloping. The opposite of a spur. The difference between a re-entrant and a depression is that water can flow downhill out of a re-entrant, while a depression will turn into a pond if it rains enough. Nine of twelve groups which make up BOF are the English Regional Associations. Their main function is to co-ordinate local fixtures and regional competitions. The local regional association for Mole Valley is the SEOA. One of the functions of BOF is to periodically change the names which indicate the relative status of orienteering events. From May 2017, run-of-the-mill National Ranking events have been renamed from Level C to "Regional". This is especially confusing as up to two reorganisations ago, "Regional" events were the next level up, with "District" being used for this level. The appropriateness of this grade name inflation can be judged from the fact that there are often simultaneous "Regional" events taking place within a single BOF region. Also referred to as Colour-coded events (a name which officially disappeared three re-organisations ago).The next level up is now "National" event, and the lower level is now "Local" event. The area (normally a couple of parked cars) where entry fees are collected, and control cards, control descriptions, and (if master maps are being used) maps are given out. If the event is using electronic punching, then it will be at registration that your details are loaded on to the event computer. The most important rule in electronic orienteering is that once registered, you must visit the download before leaving the event, even if for some reason you decide not to go round your course after all. There will be event officials at Registration to help you; if you don't know what to do, ask! A team event, usually for three people. Each person runs a separate course, or lap. Relays always have a mass start for the first lap. Each subsequent runners starts when the previous team member finishes. Each team will collectively run the same distance, and eventually visit the same controls. However, the courses for each team will be varied, or gaffled, so that different teams visit the controls in different sequences, thus preserving some requirement to navigate rather than follow the person in front. Relay entries are usually made by one person on behalf of the whole club; in Mole Valley this would be the club captain. Perhaps the most important skill in orienteering, relocation means finding out where you are after having got lost. A distinct feature that may be used by competitors to identify their position both on the ground and the map. A linear gap in trees, usually for forestry management purposes. Long distance score orienteering event, usually with a 24-hour time limit. Competitors have the choice of continuing without sleeping, returning to a central base to sleep, carrying a tent, or sleeping rough. Roxburgh Reivers. A Scottish club. Web site. The option of taking more than one (sensible) route between two controls. This may, for example, be a direct cross-country route versus a longer path route, or going straight over the top of a hill versus contouring round it. A technical term meaning to go around a course. No particular gait is implied; you can walk for the whole of your run! At events where there are different courses for different age classes, it is usually permissible to ¨run up¨ on the course for a class which is closer to M21. Thus juniors can run up in a class for older juniors or M21's, veterans can run up in a class for younger seniors; and ladies can run up in mens classes. A South Wiltshire club. Web site. The name SARUM give to their biggest event each year. Any group of events on Saturdays, but in particular a regular program of limited colour-coded events run by Saxons and DFOK as a league. Members of other clubs are welcome, but need to join SAX or DFOK as local members to score points in the league. Saxons orienteering club, based in Kent. Mole Valley's neighbours to the east. Web site. The name SAX give to their biggest event each year. Swansea Bay Orienteering Club. Web site. The ratio between distance on the map and distance on the ground. A scale of 1:10,000 means that 1cm (about the length of the nail on your little finger) on your map shows 100m on the ground (around the length of a football pitch). The scale should be printed in the ¨white space¨ around the edge of the map, probably next to the contour interval. South-Central Orienteering Association. The regional association for Berkshire, Buckinghamshire, Hampshire, and Oxfordshire. Web site. An event in which the competitor does not have to visit all the controls! There is a time limit, instead of a set course. Points are scored for visiting controls, and deducted for finishing over the time limit. The competitor has to decide which controls to visit, in which sequence. A watch is a vital item of equipment for a score event! Immensely popular biannual multi-day event held in August in odd-numbered years, comprising six Level B events in seven days, on different areas. Held in a different part of Scotland each time. Web site. Standard Entry Form. Most events which require entry in advance will accept a Standard Entry Form in the post. Must be accompanied by a cheque! Used to need to be accompanied by one or two stamped addressed envelopes for final details and results to be posted to you. These days, most people prefer to enter over the internet without using paper. A blank Standard Entry Form may be downloaded from the British Orieneering web site. South-East Junior Squad. A group of young orienteers selected by the SEOA for coaching and representative competition. Web site. South-East Lancashire Orienteering Club. Web site. South-East NIght LEague. Formerly an annual series of low-key night orienteering events held over the autumn/winter/spring season, usually on Saturday evenings. SENiLe's disappeared around 2007, but there is now a Kent Night Cup series on (usually) Thursday evenings. South-East Orienteering Association. Our local regional association. A definitive list of member clubs is hard to come by, but my attempt follows (including some which are ¨shared¨ with other regions). The open member clubs may be Mole Valley, CHIG, DFOK, GO, HAVOC, HH, LOK, MDDXO, SAX, SLOW, SN & SO, and the closed clubs may be BAOC & RAFO. Web site. South of England Urban Orienteering League. Short races are normally only taken seriously when they do not clash with a longer course at the same event. This is often the case in international competitions, when classic and short races on different days are equally prestigious. Manufacturers of orienteering equipment. Web site. The standard which you need to achieve three times on age class courses at Level A events in order to qualify for a Silver badge. Details are on a British Orienteering web page. Ski Orienteering. Orienteering on skis. Requires more snow than normally available in the South-East. An IOF web page has information. Swindon Locality Orienteering Group, defunct, having merged with MOK in 2005 to form NWO. South London Orienteers and Wayfarers. A club, Mole Valley's neighbours to the north-east, based in Wimbledon. Infamous for painting their name in roads all over the country. Web site. South Midlands Orienteering Club. Web site. Southern Navigators orienteering club. Mole Valley's neighbours to the north-west. Cover the far NW of Surrey, NE Hampshire, & S Berkshire. The south's first orienteering club, formed by Chris Brasher and John Disley in 1965. Web site. The name HAVOC give to their biggest event each year. Southdowns Orienteers. A club, Mole Valley's neighbours to the south. Web site. The name SO give to their biggest event each year. Scottish Orienteering Association. The national association for the far north. More powerful than it's eleven ¨equals¨ making up BOF; more like a mini-BOF in it's own right. Web site. Southampton Orienteering Club. Web site. The Mole Valley club newsletter, posted to members approximate quarterly. A Galoppen run by SO! A series of limited colour-coded Saturday morning events run as a league for Southdowns members. Members of other clubs who attend regularly are expected to join Southdowns as local members. Solway Orienteers. A club from south-west Scotland. Web site. Essex Stragglers Orienteering Society. Believed to be the only club besides Mole Valley to call itself a Society. Web site. The South-East Galoppen is an individual galoppen competition for members of clubs affiliated to the SEOA. Uses the same events as the South-East League, but unlike the League, it runs over each calendar year. There is a separate competition for each course; that is, not just is each age class scored separately, but also Long and Short or A and B courses have their own ranking lists. The first member of a SEOA club on each course at each event gets 100 points, the second 99 points, and so on. The points accumulated at the various events over the year are added to give the individuals total. It is not necessary to run absolutely every event, since the number of events which count is slightly smaller than the total. For example, if there are six SE League events during the year, the Galoppen will take the best five scores. The South-East League is an annual competition between the member clubs of the SEOA. The SEOA committee choose which events will form part of the League, usually picking all the Level B events scheduled for the region. The League is contested over each autumn/winter/spring season. Individual orienteers score points for their runs. At each event, the points scored by the members of each club are aggregated to give club scores. The clubs are then ranked in order of their scores. Finally, South-East League points are allocated to the clubs based on the club order from the event. At the end of the season, the club with most points is the winner. Anyone completing any course at any South-East League event scores at least one point. Runs on the string course, colour-coded courses, and slow completions of age class courses score one point. Faster runs on age class courses score points according to how fast the individual has done against a target speed. An SEOA web page has further details. Fortunately you do not need to memorise the scoring formulae before running at a League event! An annual score event at which individual members' points are used to score an inter-club competition. Each club gets the aggregate points of its top twelve individual scorers from different age classes. The ¨different classes¨ requirement stops the competition being dominated by the younger adult males, and for most clubs means that almost all their younger, older, or female members have a significant chance of contributing to the club score. The rules provide for ¨automatic running-up¨, which basically means that club captains don't have to worry about picking team or asking people to enter running-up an age class. Instead, the organiser will use the event results to select the twelve people, with running-up, who give each club the best score. For example, if a club has two M40 runners who are both expected to outscore all their M35's, without automatic running-up, the club captain would have to ask one of the M40's to enter as M35. With automatic running-up, he doesn't have to worry, and if both M40's do beat the M35's, then it will be the two M40 scores that count. An annual competition open to members of SEOA-affiliated clubs, held at a Mole Valley District event, usually in the autumn. Unusually, ¨veteran¨ for this competition means age classes M40 or W40 and older. The gentlemens' competition is held on the Blue course, the ladies' on the Green. In recent years, a ¨family¨ competition for related entrants has been held at the same event. New classes for M60+ (on Green) and W60+ (Short Green) were added in 2010. Annual league of urban events, mostly full-length rather than sprint. A local version of the Nopesport league. Web site. Sadly defunct series of short races held at monthly intervals in the spring in the South-East. A score event at which the competitors do have to visit all the controls! The person with the fastest time wins. The difference between this and a normal cross-country orienteering event is that the controls may be visited in any order. At events where start times are allocated in advance, parents may request ¨split¨ early and late starts, hopefully meaning that one of them is always available to look after the children. A results display showing the times taken over each individual leg. One of two competing forms of electronic punching equipment, replacing the traditional paper control card and needle punch. With SportIdent, you carry a ¨dibber¨ (illustrated) strapped to your index finger, which you poke into a hole in a metal box at the control site. The box then bleeps and flashes to acknowledge your presence. SportIdent is more popular than the rival Emit system in Britain. Web site. Biannual event held over the late May Bank Holiday weekend in odd-numbered years, usually comprising three Level B events on different areas in Shropshire. Web site. Ultra-short distance orienteering, likely to be planned for a winning time of 12 minutes. Note that this is still far too long for what a track athlete would regard as a sprint. A sprint course is characterised by very short legs and changes of direction, requiring quick thinking. ¨A sprint for the mind rather than for the body¨. Sprint events are usually, but not invariably, urban. South Ribble Orienteering Club, based in North Lancashire. England's first orienteering club, founded 1964. Web site. St Andrew's Glasgow Orienteering Club. A Scottish club. Web site. The beginning of your orienteering course, the point at which your time starts. There will be event officials at the Start to help you; if you don't know what to do, ask! The point where the course marked on your map starts, marked on the ground by a control kite with no punches. Normally, this will be very close to the real start of your course, but occasionally you will have to follow a taped route. Often you need to find a map between the Start and the Start Triangle, either a Master Map which you need to copy your course from, or a pre-marked map which you must take with you. An event on public roads and footpaths, rather than in the countryside. May be anything from a World Championship short course to low-key club training. In the latter case, probably score event, with no kites or punches, competitors taking a pen or pencil and writing down answers to simple questions at each control. An orienteering course for children too young to read a map reliably. Although a map will be provided, a string or thin rope is laid out along the ground as a guide. The start of the string course will normally be in a different place to the starts of other courses, so make sure you follow the right signs. Suffolk Orienteering Club. Web site. South-Western Orienteering Association. The regional association for South-West England. Web site. South Wales Orienteering Club. Web site. South Yorkshire Orienteers. A club. Web site. Biannual event held over the late May Bank Holiday weekend in even-numbered years, usually comprising three events on different areas in the far south-west. Organised by the KERNO and DEVON clubs. Web site. A route for you to follow, marked with lengths of plastic tape. There may be a continuous length of tape, or there may merely be fragments hung intermittently from bushes. Taped routes are likely to lead you from the car park to the Start and from the Finish back to the car park. You may also have to follow a taped route as part of your course, most commonly from the last control to the Finish. The colour of the tapes used varies, but should not be yellow or black. Yellow or yellow/black tapes have a very specific meaning in orienteering; they indicate danger, such as the top of a cliff. It is not usually a good idea to follow them! Tayside Orienteers. A club. Web site. Trail Cyclist Association. Defunct name for British Mountain Bike Orienteering. Grading of difficulty, ranging from 1 (easy) to 5 (very hard). A table in this British Orienteering document explains technical difficulty in more detail. A form of Trail Orienteering decided on entirely on time. Still not a race, in the sense that there is no running between controls. However, the time taken to solve each control problem is recorded, and a time penalty is added for getting the answer wrong. Fastest time (after penalties) wins, meaning that fast and nearly always right beats slow and right all the time. Further details on this British Orienteering web page. Annual pair (Saturday & Sunday) of Level B events named for Thetford Forest, usually organised by two different EAOA clubs. A small compass which is worn strapped on to the thumb of the hand carrying the map. A confusing term, since your time is not recorded when you start, like it would be for a punching start. Instead, your course time will be calculated on the assumption that you started at exactly the moment allocated to you by the event organiser. If you are late starting, the delay will be added to your run time. The start officials should ensure that you do not start early! Tinto Orienteers. A club named for a hill near Edinburgh. Web site. A type of orienteering aimed at introducing road and track runners into the sport. A mass start event with control sites of technical difficulty appropriate for a yellow course, route choice problems of orange standard, but much longer than either of these; there has been a half-marathon (21km) trail challenge. A type of orienteering originally invented for the disabled, but equally difficult and challenging for the able-bodied. Instead of one control kite at each control, there are several and the competitor has to study the map to decide which is in the right place. The event is not a race; the winner will be the person who most often identifies the correct control flag. The competitor is not allowed right up to the control site, but has to study it from a distance. The route between the controls, or rather between the points from which the controls are viewed, must be suitable for wheelchairs. IOF web pages provide a basic introduction and a more detailed guide to techniques for getting the right answers (5MB). Traditional Trail Orienteering, as described here, is now called Pre-O, to distinguish it from the newer ¨sprint¨ version, called TempO. New British Orienteering TrailO website. Intermittent multiday event somewhere near the River Severn over the first May bank holiday, typically a full length event on the Sunday, preceded by a shorter distance race on Saturday and followed by some sort of relay on Monday. BOK always seem to be involved, sometimes assisted by NGOC or SARUM. Thames Valley Orienteering Club. Web site. Annual two-day event organised by MDOC. Usually two Level B events, sometimes one of them is Level A.
Waterproof and tear resistant paper once used for control cards. Annual series of races aimed at elite orienteers, with classes for M21, W21, M20-, W20-, M35+ & W35+. Points are gained based on finishing position in each race. Something like sixteen races, with the best nine results for each competitor counting. The highest scorers then compete in a ¨final¨. Web site. Replaced by the UK Orienteering League from 2013. Annual series of races to encourage veteran competition at major events. Fell defunct, but resurrected for 2011 & 2012, before being replaced by the UK Orienteering League for 2013. Overall scores will be the best 8 from 19 designated events, listed on this British Orienteering web page. Annual series of races to encourage competition at major events. New series for 2013 covering all age classes from 16 upwards, replacing separate the separate competitions which used to exist for older juniors, seniors and veterans. Will consist of 16-20 events from February to November spread across the country, featuring a range of competition formats and terrain types. A competitor’s overall score will be their best 10 or so event scores. Web page. New name coming in for the Nopesport Urban League as the original founders of the competition lose interest. Website. Vendor of orienteering equipment, with a stall at every major event and many minor events. Web site. Really short orienteering event, even shorter than a normal sprint. Usually containing a maze section made up crowd-control barriers or similar. Probably more than one race in the competition so that you do run for more than a few minutes. The normal rule about control separation does not apply, and you are likely to get controls on each side of a tree, with a time penalty rather than disqualification if you punch the wrong one. Traditionally, orienteering events have taken place in forests, or possibly open areas such as sand dunes or moorland, but definitely in the countryside. In recent years, events in town and city streets and parks have become popular. The first urban events tended to be sprints, but now full-length urban events are quite common. The trophy presented to the fastest man at the Mole Valley club championship, contested annually at a colour-coded event. Traditionally run over the longest available course, but in recent years a Blue course has been chosen to allow the more elderly or less fit to join in. Also a frequently used name for a Mole Valley relay team. Someone who has already reached the year of his or her 35th birthday, i.e. age class M35, W35, or older. Some competitions use different definitions, for example the Southern Express veterans classes are for M/W45+. Veteran Home Internationals. Annual event for teams of veterans from England, Wales, Scotland & Northern Ireland. Veteran World Cup, old name for WMOC. West Anglian Orienteering Club. Web site. Warrior. An orienteering club based in the Lake District. Web site. What orienteers need after a run! Formerly also Wash orienteering club, which merged with NORwich to form NORfolk Orienteering Club early in the current century. Walton Chasers orienteering club. Based in South Staffordshire. Web site. West Cumberland Orienteering Club. Web site. Slang term for the runnable forest indicated by the absence of any colouration on the map. The shortest and easiest colour-coded course. Route should be entirely along paths and tracks, with a control at every decision point. May not always be provided, in which case the easiest course would be Yellow. One of the longest standing regular events in Britain, this is a three-day event organised by EBOR on the North Yorkshire Moors every August Bank Holiday since 1972. The first two days feature Level B events, the third some form of team event, possibly a Harris Relay. Unusually, teams are not restricted to members of the same club. In recent years, sprint, night and mountain-bike events have been added, so if you have the energy you can do six events in three days. Web site. The orienteering club for the Isle of Wight. Now almost the only club still using traditional paper control cards and pin punches. Web site. Much-missed travelling caterer renowned for their vegetarian chilli and pasta. Now sadly given up visiting orienteering events to concentrate on running their famous café at Staveley. Web site. Wimborne Orienteers. A Dorset club. Web site. Course with a modified map occasionally found at a training event or activity. Instead of the whole map being printed, only a small area around each control will be shown, with blank areas inbetween the controls. This will force you to practise navigating by following a compass bearing and keeping track of distance travelled, probably by pace-counting. It will probably give you relocation practise too! The name WIM give to their biggest event each year. West Midlands Orienteering Association. The regional association for the West Midlands. Web site. World Masters Orienteering Championship. Annual event to find a world champion in each age class from M/W35 upwards. There is no selection, so you don't have to be any good to enter. There are two qualifying days, and then a finals day. Although everyone gets the chance to run in a final, you may (depending on your age) have to be pretty useful to reach the ¨A¨ final, the winner of which becomes the World Champion. There are usually several Moles competing each year, although none of us has won yet. Welsh Orienteering Association. The national association for Wales. Web site. World Orienteering Championships. An IOF event for elite orienteers selected by national federations, now held annually. Britain has had two World Champions, Yvette Baker won the short distance class in 1999, and Jamie Stevenson won the sprint class in 2003. World Orienteering Cup. Another IOF event for selected elite orienteers, this one takes place at several venues throughout the year. Less prestigious than the World Championships, but arguably harder to win. Wrekin orienteers. A Shropshire club. Web site. World Ranking Event. An event for which the results count in the international ranking list. There are just two lists, one for men and one for women, with no split between age classes. At an age class event, world ranking points are only available on the M21E and W21E courses or equivalents. An IOF web site has details. Wessex Orienteering Club. Web site. Formerly Wye Valley orienteers, merged with Harlequins Orienteering Club early in the current century. Not an orienteering term, but an excellent piece of free software used (not as often as it should be) to check this web page for ¨broken links¨, i.e. out of date Internet addresses. Web site. A fairly short and fairly easy colour-coded course. Longer and harder than White, shorter and easier than Orange. The route should be obvious, following line features such as paths, fences, or streams. Controls should be on the feature being followed. Yorkshire & Humberside Orienteering Association. The regional association for the old county of Yorkshire. Web site. An annual English inter-club competition for juniors, a sort of junior CompassSport Cup. Named after Britain's best-ever orienteer, who was World Champion in 1999. Competition rules in a British Orienteering document. Yvette Baker Trophy matches are normally held at District events that are open to adults too. Noise likely to be made by someone attempting to read this entire web page in one go! Back to top of this page. Back to home page. E-mail webmaster. E-mail Jargon Buster compiler.